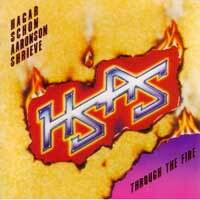 Hagar Schon Aaronson Shrieve (HSAS) were a band featuring vocalist Sammy Hagar (ex-Montrose), lead guitarist Neal Schon (Journey), bassist Kenny Aaronson and drummer Michael Shrieve. Shrieve and Schon had played together in Santana in the early 1970's. Together this short live "supergroup" recorded this one album, which is actually a live album with the audience deleted from the majority of the tracks. The band actually wrote and recorded twice the songs that were released and several bootlegs of the performance which was aired. To record their album, the band played live dates from November 9, 1983 to November 21, 1983 at the Westwood One Mobile Facility. Two of the dates, November 14 and November 15 in San Jose, California were recorded and broadcast by MTV. The "Through the Fire" album was apparently edited in-studio to remove the crowd noise, but as far as I have read, the recording was otherwise was left alone. As such, the entire album has a raw, hard rock sound and has more balls than anything Hagar or Schon would record in the coming years with either Journey or Van Halen. My favorite part is the medley made up of "Animation", "Valley of the Kings" and "Giza". It has a cool, atmospheric vibe and the guitar work is outstanding. The band's cover of Procol Harem's "Whiter Shade of Pale" is fun. The song starts off with Sammy Hagar's voice only supported by some acoustic guitar...then the band build it to a crashing climax, including a stellar solo from Schon. The album closes with three hard rockin' songs, leaving this listener longing for more, especially knowing there was more recorded than was included here. This line-up only lasted for this one album before Hagar joined Van Halen and Schon went back on tour with Journey.